Trust Your Vessel With Us - We Have The Experience! a US Coast Guard 200 ton licensed captain with more than 30 years, over 330 deliveries and over 265,000 miles of successful, full time yacht delivery experience with no accidents, injuries or insurance claims. 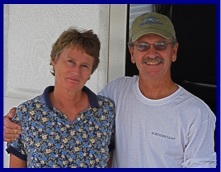 Captain Jerry Taylor and his wife Wendy specialize in delivering power and sail boats from 40 to 100 feet. Together they have crossed oceans, lived aboard for many years, and have the hands-on knowledge that can only come from a lifetime of professional and personal association with yachts and yachting.